Home » General Musings » Should I be watching Outlander? Should I be watching Outlander? As you may have noticed…I’m Scottish. I’ve lived here all of my life and I am proud to live in such an interesting and quirky country. I love potato scones but am not fond of Irn Bru. I roll my r’s when talking, use words like wee and dreich and always say ‘I’m going to the pictures‘ when going to the cinema. With that in mind, I put the question to you….should I be watching Outlander? I can’t avoid it, everywhere I go online there are adverts telling me to watch it. And it sounds right up my street – time travel and adventure? Sold! But here is my problem….. in the advertising I’ve seen lots of men in kilts with open shirts. I’ve seen green rolling hills and women with perfect hair. 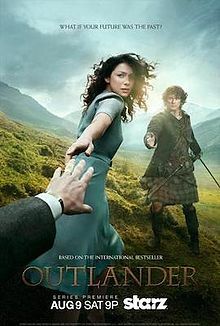 If I watch this am I letting myself in for the biggest fantasy Scot-fest possible? Will Outlander annoy me because of all this? Will the accents be so bad that they will want to make me throw my haggis at the TV? Will the fact that everyone will probably have perfect teeth, luscious locks and a 6 -pack leave me totally scunnered? Please! If you have seen it let me know? I’m torn between wanting to check it what could be a really good show and not wanting to grind my teeth every time a dodgy Scots accent is on screen. Help!